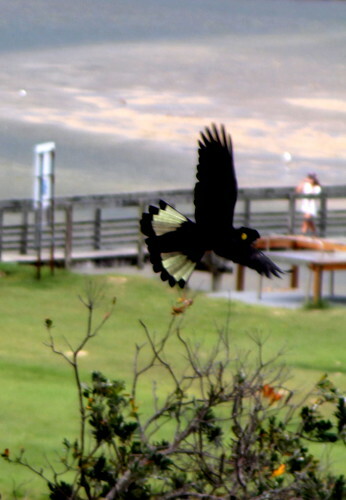 From On top of the Hill : The Peacocks tail ... What hinders men from seeing and hearing God? The Peacocks tail ... What hinders men from seeing and hearing God? It is their own hearing, seeing and willing; by their own wills they separate themselves from the will of God. They see and hear within their own desires, which obstructs them from seeing and hearing God. Terrestrial and material things overshadow them, and they cannot see beyond their own human nature. If they would be still, desist from thinking and feeling with their own self-hood, subdue the self-will, enter into a state of resignation, into a divine union with Christ, who sees God, and hears God, and speaks with him, who knows the word and will of God; then would the eternal hearing seeing and speaking become revealed to them. " ‘Cauda Pavonis’, the peacock’s tail, or the peacock itself, is a phase in which many colors appear. Many alchemists place this phase before albedo, whiteness, although some of them place it after albedo. Gerhard Dorn (16th century): "This bird flies during the night without wings. By the first heavenly dew, after an uninterrupted process of cooking, ascending and descending, it first takes the shape of a raven’s head, then of a peacock’s tail; its feathers becoming very white and good smelling, and finally becoming fiery red, indicating its fiery character." The colors refer to the three stages of the Great Work, with rubedo, or redness, being the last one. The drawing represents Distillatio, 'distillation'. At a certain point in the distillation the peacock('s tail) will appear. 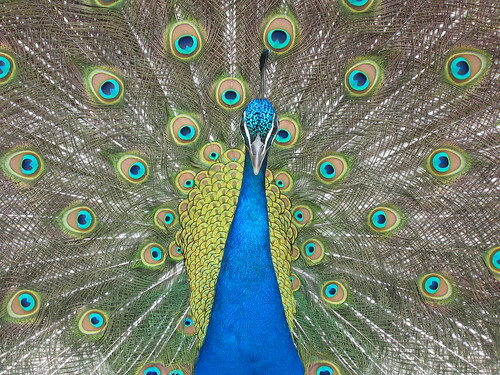 The symbol of the peacock’s tail was chosen because of the many colorful and brilliant ‘eyes’. It is said that originally they were the eyes of the Greek Argus, whose name means ‘he who sees everything’. Argus was a very strong giant with a hundred eyes, of which at all times fifty were open and fifty were sleeping. He was decapitated by Hermes. Hera, the mother goddess, placed the eyes on the tail of her favorite bird, the peacock. The phase of the many colors was also symbolized by the rainbow, or the goddess of the rainbow: Iris, the messenger of the gods, especially between Zeus and the mortals. The peacock’s tail can have two meanings in the Great Work. It can be the collection and totality of all colors in the white light. Remember, the white light refers to the second stage, albedo, or whiteness. In this sense the peacock was seen as a royal bird in ancient times, and it corresponded with the phoenix. The second meaning is that it represents the failure of the alchemical process. When the conscious enters the unconscious "each part of a thought can take shape and become visible in color and form", according to a Chinese text about yoga exercises. One starts seeing all kinds of forms which look real and which look like they have an independent life. But one cannot go into it as it leads to discord of the mind, and possibly to schizophrenia. The alchemist is seeking unity, expressed in the white light. It is know that during meditation exalted feelings and unusual observations can happen. In essence there are two kinds of observations. The first one is wanting to escape the discipline of meditation, which Zen practitioners call makyo. Makyo are illusions we project onto reality in order to escape the guidelines of meditation. For example, the object of meditation is starting to radiate with a wonderful light or color, or it expands and contracts rhythmically. One starts to feel lighter or heavier, or one feels pleasant energies going through the body. All kinds of sensations can happen. Many meditators are readily distracted by these phenomena, and even take great interest in them, thereby neglecting the real purpose of their meditation. One needs to be aware of this. A second cause of distraction is a change in consciousness whereby we look at the world in a different way than we did in the past. It can be quite a shock reverberating on the psychic or bodily level. The accompanying feelings can be quite wonderful. But the advice is: enjoy it, do not take it seriously, and continue with the meditation. Visions are also distracting. Many wise men and mystics have pointed to this kind of danger. "We should not long for or expect visions. With all our power we should refrain from them and look at them with suspicion." (Ignatius of Loyola). They always stress that visions of lights, of angels, yes even of the great masters, should be neglected, because they block inner progress.